Silver Elite: Malcolm No Middle 09 features super silver mirrored lenses. The wire frame is a polished silver and temples are matte black acetate. The silver ceramic nose pads are hypoallergenic and super silver metal side inlays complete the luxe look. Flattering and flexible: Malcolm is a sleek, squared-off interpretation of the traditional aviator shape constructed using only the finest materials and best craftsmanship. Each frame is meticulously handmade in Japan and features high-quality shatterproof lenses with 100% UV protection. 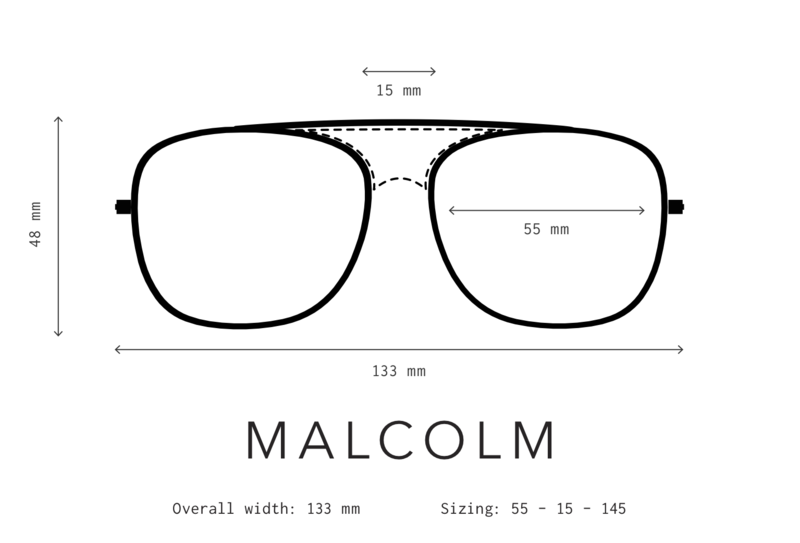 The Malcolm shape was designed to be flattering on all faces. Its super-durable surgical stainless-steel construction and smooth, high-quality hinges ensure these will be your favorite shades for years to come. Malcolm No Middle styles feature a single brow bar, and frames are lightweight and super flexible for a comfortable fit. Malcolm is a sleek, squared-off interpretation of the traditional aviator shape. With its wired temples, optional bridge insert and edited 70's design, this sharp looking frame is the epitome of less is more.